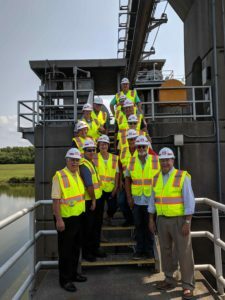 KRPD Board Tours Jerry F. Costello Lock and Dam Dewatering – Inland Rivers, Ports & Terminals, INC. The Kaskaskia Regional Port District toured the dewatering of the Jerry F. Costello Lock and Dam on the Kaskaskia River. The dewatering is a monumental task that is normally scheduled every 10 -15 years. In the 44 years of operation the Jerry F. Costello Lock and Dam has never been dewatered for a thorough inspection. Courtney Wilson, Assistant Manager for the Corps, led the KRPD Board on a tour that included a totally dewatered chamber. Crews were replacing timbers on the gates. In addition, Ms. Wilson informed KRPD of another critical need that has been approved for funding is the repair of the upstream scour. This is a critical repair to insure the integrity of the lock and dam. The Corps has been working with all the users of the river to get ready for this extended closure. Preparation began last year to schedule cargo and stage commodities upstream to be ready for the outage. The inspection and closure is scheduled to end on August 27th. The lock and dam was placed into operation in 1974. Throughout the years over 62.7 million tons of cargo were shipped on the river. Last year over 1.5 million tons were locked through. Tonnage on the Kaskaskia River has been steadily increasing each year. The cargo shipped today is a diverse mix of grain, scrubber stone, slag, coiled steel, frac sand and fertilizer. Board Members from the Kaskaskia Regional Port District Tour the Jerry F. Costello Lock and Dam during dewatering.